Based on the real memoirs of Mr. Watson’s grandfather, this story follows Kid Clay through the Old West in search of a cowboy adventure. 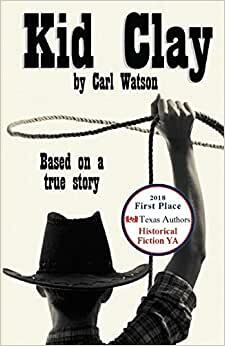 During his escapades, Kid Clay leaves his comfortable Kentucky home at the age of fifteen and sets out to discover what it’s like to be a real cowboy. During this time, he encounters many colorful characters such as Indians, Buffalo Bill, and members of the Dalton Gang. Along the wagon trail, he encounters typhoid, cattle rustlers, stampedes, bank robbers, and a beautiful Indian maiden. Kid Clay has the determination and bravery he needs to survive, but as he makes his way along the trail, he discovers that the West is beginning to change. That’s when he makes a momentous decision that will affect the rest of his life. Start reading Kid Clay on your Kindle in under a minute. 5.0 out of 5 starsThe reader gets a glimpse into the real world of the cowboy during the years of the very last big cattle drives to the north. I love this book! Kid Clay, like most teens, is restless. He wants adventure, excitement, and a different life. So, Kid takes off to see the wild west and to live the life of a Texas cowboy. Along the way, he meets all sorts of people, each making decisions that effect their life ~ some good, some bad. This book takes on tough subjects like having a friend who breaks the law... having someone you respect die, and more. It also shows that you can admire someone, like a Texas Ranger, but still decide that isn’t the life you want. All without being preachy. Kid Clay stays true to himself, as he discovers who he is. Again, I really liked this book! When young Henry Clay sets our looking for adventure in the western frontier of the late 1800s, he finds it—along with an illness that almost takes his life, several encounters with cattle rustlers, a brief meeting with the infamous Dalton gang, and all the challenges and discomforts life on the open plains has to offer. Due to his youthfulness, Clay picks up the trail nickname Kid, but during his years on the frontier, he manages to overcome any sense of belittlement the name might convey. Kid Clay is based on the memoirs of Carl Watson’s grandfather, Henry “Kid” Carleton Clay, who was born in Kentucky in 1865. As the son of a judge, young Henry is expected to follow in his father’s footsteps and go into law. However, Henry has an unbearable itch to explore the west he has heard about in stories related to his grandfather Simon Kenton and his distant relative Kit Carson. As Kid recovers from Typhoid Fever and works his way across Texas and New Mexico, into Colorado and Nevada, he finds the west lives up to his expectations. It is a place filled with adventure, danger, unbelievable beauty, and the opportunity to meet some of the finest people on earth, Buffalo Bill among that number. But it is the ordinary people who mean most to Kid— the woman who nurses him back to health, his fellow trail riders, the ranch bosses, and the tribe of Indians with whom he lives for a year. Kid’s Kentucky upbringing includes training as a horseman and skill with using guns, both abilities that serve him well on the frontier. However, after years of indulging his yen for adventure, Kid finds a different sort of yearning replacing his old urges. The once-wild west is changing, as is Kid, and a new future opens for both as the story closes. What I enjoyed most about this historical book about the adventures of the author's grandfather was the factual information about how cowboys lived on the trail. This book will be a treasure to the author's family generations from now. It's monumental the amount of famous Western pioneers--good and bad--that Kid Clay met and worked with. Note to young people for book reports: This book is a fast year, and accessible for MG readers, ages 8 and up.